We built a drag racing game between 4 cars inside Decentraland. 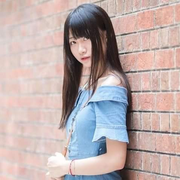 Some of the game mechanics are defined and controlled through NFTs and smart contracts. An app provides the ability to bet on the race results. 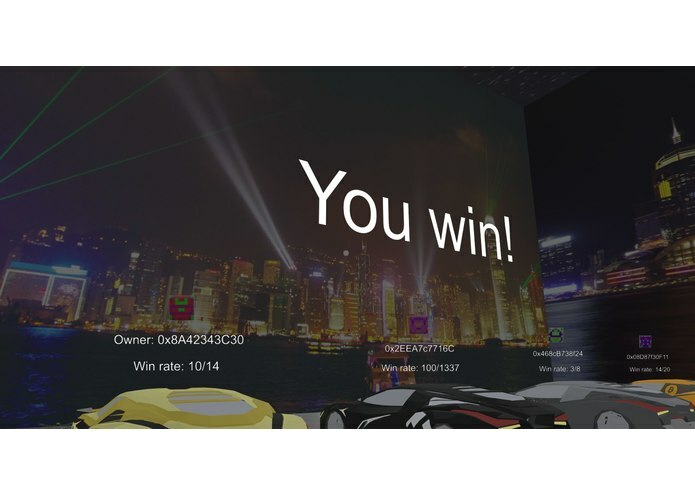 We used Decentraland SDK to simulate the race. We developed and deployed the Ethereum smart contracts using Truffle. 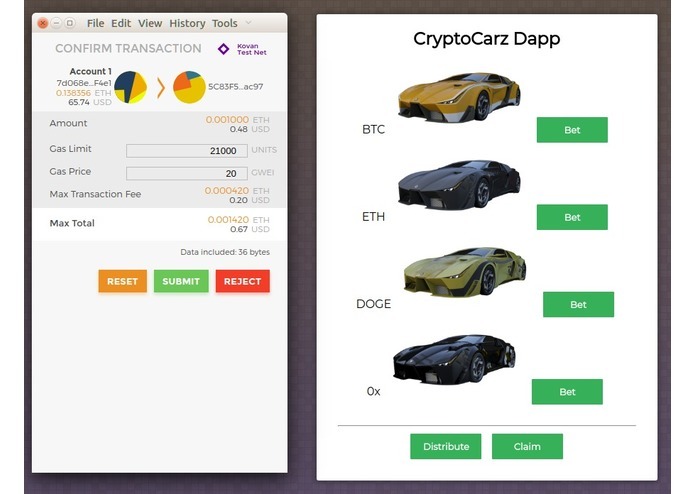 For the betting Dapp, we use Metamask and Toshi. None of us had previous experience with Decentraland SDK, so it was difficult for us to pick it up quickly. The documentation is not very exhaustive either. But overall the platform is great and we were able to run a simple straight-line race. 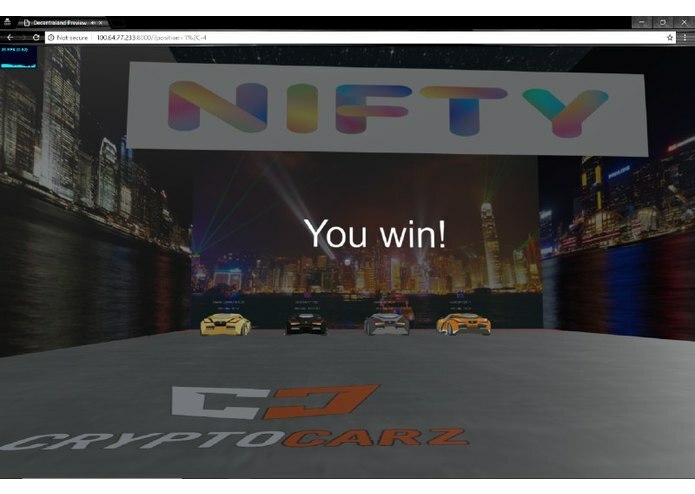 We are the first racing game on the decentralized virtual world! Our team worked very hard to complete the Decentraland SDK and smart contract code on time. 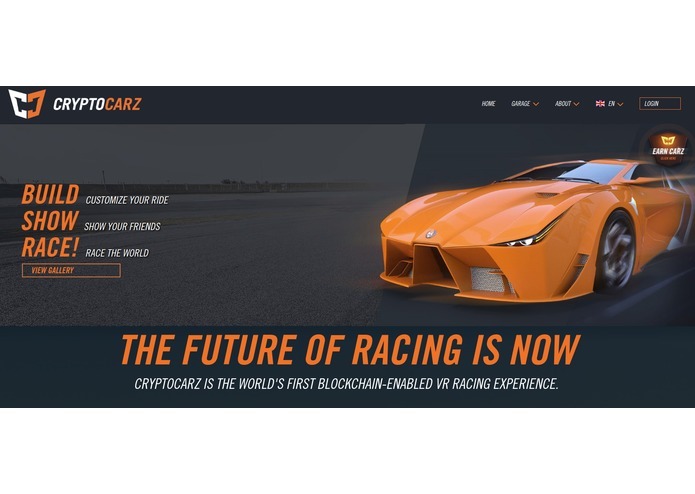 We have got some CryptoCarz racing! We learned a lot about Decentralnd SDK and how to integrate Dapps into Toshi, and more to come! Implementation of multisig walllets to split entry fee for the tournaments between different entities such track owners, tournament organizers, platform providers, etc Integration with market data feed from multiple exchanges, weighted by volume to smoothen out data feed Implement market data feed using DEX feed to further decentralize the game, when DEX volume will be sufficiently high. Implement odds for the betting, possibly integrating with existing prediction market platforms like Augur or Gnosis Adding more complex geometries for the track where other characteristics of the car impact the race, such cornering speed etc.